The scope of the retail supply chain is constantly evolving. From new customer demands to the technology to keep up with those demands, staying at the forefront of supply chain innovation has never been more crucial. For insight on the current and future state of the industry, you are invited to attend the Trends in Supply Chain Management Conference Thursday, April 25. Supply chain management experts from across the region will share their insights into how digitization and other technology trends are shaping today’s supply chains. The conference will be held starting at 8:30 a.m. at the Donald W. Reynolds Center for Enterprise Development on the University of Arkansas campus. 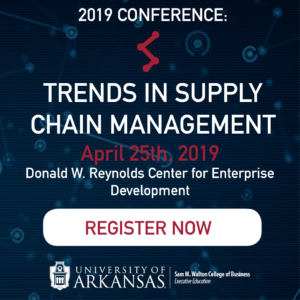 The conference is hosted by the Supply Chain Management Research Center and the Executive Education program at the Sam M. Walton College of Business. Executives from Walmart, Tyson Foods, J.B. Hunt Transport Services, Inc., project44, Kellogg’s, SupplyPike and more will share their perspectives on how digitization and technology trends are revolutionizing supply chains. You don’t have to be a supplier to attend! Brent Williams, associate dean for executive education and outreach for the Walton College, encourages attendance for many industry leaders. Professionals in logistics, manufacturing, retail and technology will find the content relevant and engaging. For a conference agenda and to register, click here. We’ll see you April 25! This entry was posted in Supplier tips and tagged sam m walton college, Supply Chain, trends in supply chain, Walton College of Business. Bookmark the permalink.